Looking for the best jacks for your vehicle? No worries of being stuck in the middle of nowhere. 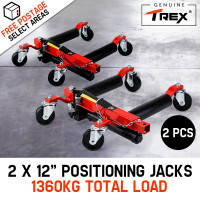 Bullet and T-Rex have a great range of 4WD Jacks and Accessories to help you lift or position your vehicle off the ground easily and safely. Made from strong and high quality materials, these jacks were designed to have a serious lifting capacity. Suitable for various vehicle types including vans, boat trailers, shift cars and even light trucks, the 4WD Jacks are constructed from ultimate high-tensile steel to help drivers reposition and relocate non-running vehicles in minutes. To ensure ultimate protection, the jacks have several features such as safety pins and a quick attach/release so the vehicle weight will be distributed when used on soft surfaces like mud or sand. Have a hassle free trip. With Bullet's Exhaust Jack, you can better enjoy your outdoor time with family and friends. For your convenience, the exhaust/compressor/hand pump comes with an extra long exhaust hose and an extension hose to support better vehicle positioning. Also included are gloves, a repair kit as well as a quality carry bag for easy storage of the equipment. In addition to 4WD Jacks and Accessories, a fine line of Chargers and Jump Starters are also available at Edisons to ensure that you are not stranded on the road side during your trip. In search for premium Roof Racks, Car Awnings, 4WD Storage Drawers, Driving Lights and other 4WD and Ute accessories? 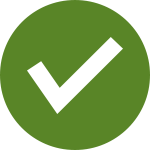 You can check out Edisons as it offers top notch automobile supplies and accessories including Ramps, Air Tools as well as Oil Pumps. So what are you waiting for? 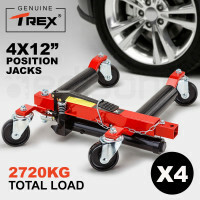 Get your own 4WD Jacks now and pair it with the other accessories from Bullet and T-Rex. 1 year warranty is available when you purchase any of these today.